A confirmed case of measles last week in a Waiopehu College student has prompted health officials to advise closing the school Friday. The student concerned was at school last Thursday and Friday (12 and 13 May) before signs of any infection were showing. However I have been advised that during this time the student would have been infectious. The student is now at home and recovering. Students/parents are asked to bring proof of 2 MMR vaccinations to the main school office on Friday. If they can do that, they can return Monday. School officials say if your child has not been vaccinated or you cannot obtain proof then unfortunately he/she will not be able to return to school until Monday 30 May 2016. According to WHO, the first sign of measles is usually a high fever, which begins about 10 to 12 days after exposure to the virus, and lasts 4 to 7 days. A runny nose, a cough, red and watery eyes, and small white spots inside the cheeks can develop in the initial stage. After several days, a rash erupts, usually on the face and upper neck. Over about 3 days, the rash spreads, eventually reaching the hands and feet. The rash lasts for 5 to 6 days, and then fades. On average, the rash occurs 14 days after exposure to the virus (within a range of 7 to 18 days). 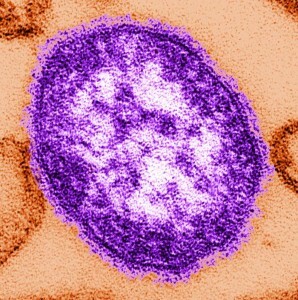 Most measles-related deaths are caused by complications associated with the disease. Complications are more common in children under the age of 5, or adults over the age of 20. The most serious complications include blindness, encephalitis (an infection that causes brain swelling), severe diarrhea and related dehydration, ear infections, or severe respiratory infections such as pneumonia.